Summary: Learn how to replace a radiator, remove the old radiator, fit the new radiator and fix radiator brackets. If your radiator is leaking because of corrosion, you will need to replace it. When you remove the old radiator water may drain onto the floor, so it is advisable to place polythene sheeting and old towels under and around the radiator. Turn-off the thermostatic or handwheel valve. 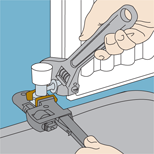 Remove the plastic valve cover and turn-off the lock-shield valve using a spanner. Make a note of how many turns of the spanner it takes. Position a bowl under the handwheel valve and unscrew the union nut that connects the radiator to the handwheel valve. Drain the water into the bowl. To increase the flow, undo the bleed valve. Have more than one bowl handy, as there will be quite a large amount of water. After the water has stopped flowing unscrew the union nut on the lockshield valve. Be careful, as this may result in more water draining out. Use absorbent paper to block the open ends of the radiator to prevent any water spilling onto the carpet when carrying it outside. Lift the radiator off its wall brackets and remove. Radiators can be heavy so get some help if you need it. If keeping the connecting valve tailpieces from the old radiator remove them with a spanner. Looking at the valves from each end of the radiator unscrew them anti-clockwise. With a bowl in place underneath, unscrew the union nut that connects the radiator to the handwheel valve. If you are keeping the connecting valve tailpieces from the old radiator, remove them with a spanner. Make sure the connectors are clean and wrap PTFE tape around the thread of the tailpieces of the connector valves. Apply jointing compound over the base to make a tighter seal. Then screw the tailpieces into the new radiator. Wrap PTFE tape around the base of a bleed valve and insert the valve into the hole in the top of the radiator. Also at the top of the radiator, but at the opposite end to the bleed valve, fit a new plug if required. Line up the connector and supply pipes and connect the valves. Use a wrench to hold the valve in place as you tighten the nuts with a spanner. Ensure the joint is secure but be aware that excessive tightening may damage the fitting. Turn on the valves to refill the radiator with water and then bleed the radiator. Also at this stage inspect the radiator for leaks. Finally, open up the lockshield valve to its original position, remembering the number of turns it took to close it. Lay the radiator on the floor in front of the section of wall to which it will be fixed. The distance from the radiator to the wall and the height of the supply pipe and valve above the floor should be the same. With a pencil, mark a vertical line on the wall in line with the position of the radiator's fixing brackets. 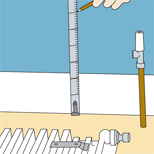 Measure the distance from the skirting board to the bracket and transfer this measurement onto the wall dissecting the vertical line. Where the pencil lines cross, drill and plug pilot holes at these points. Screw the bracket to the wall and repeat this for the other bracket. Position the radiator onto the brackets. 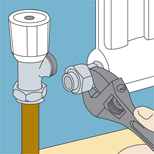 If the radiator does not align with the supply pipe and valve, loosen the screws on the brackets and move them up or down until the radiator is in the correct position. Finally, tighten the screws.